Suspended NFL wideouts Josh Gordon and Martavis Bryant may be able to apply for reinstatement by May, according to Tom Pelissero of NFL.com (Twitter link). Both Gordon and Bryant are suspended — not banished — from the NFL, which, as Pelissero note,s in an important distinction given that banishment would have lead to a one-year minimum absence from the league. However, both pass-catchers’ suspensions are indefinite in nature, so there’s no clear timeframe on when they can attempt to re-enter the NFL. Nevertheless, if both Gordon and Bryant execute their treatment plans in accordance with the league’s wishes, the NFLPA may begin to “lay groundwork” for returns in May, per Pelissero. 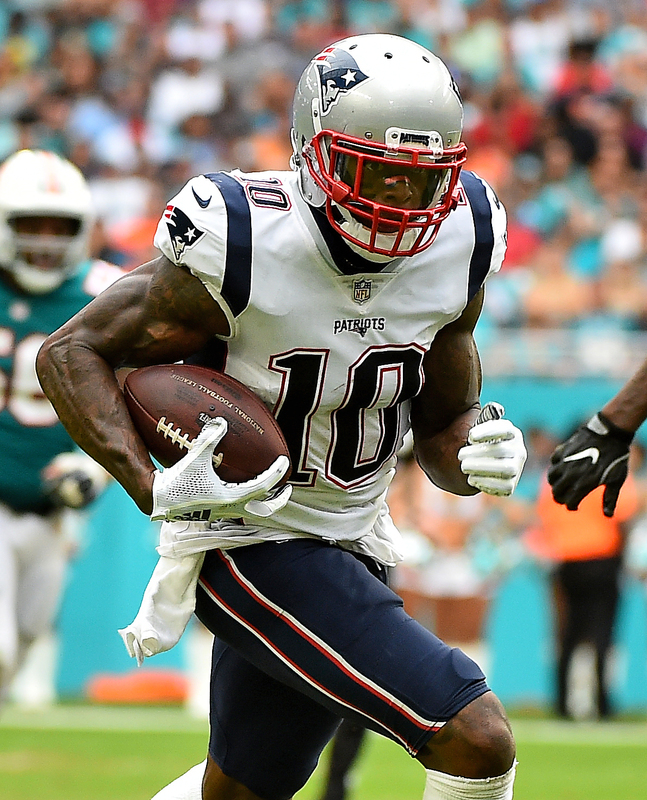 Such a plan could could potentially put both players back on the field by training camp, something Ian Rapoport of NFL.com reported — at least, in the case of Gordon — on Wednesday. Gordon, whom the Patriots acquired at midseason from the Browns, is scheduled to become a restricted free agent next month, so New England will soon need to decide at what level it will tender the 27-year-old. Bryant, meanwhile, was traded from the Steelers to the Raiders during the draft, but was subsequently cut and re-signed in September. He’ll be an unrestricted free agent in March, but clearly shouldn’t be expected to find a new team until later this summer, at the least. Multiple time offenders and aren’t even forced to sit out a season? Either the nfl needs to do away with substance abuse suspensions or they need to really look at how many chances a player gets. We’ve all seen it before where everyone says they’ve turned over a new leaf. Just get rid of the policy all together. I agree. Ridiculous that these two are gonna get yet another chance. Enough is enough. Both should be banned by now. The AAF is suppose to be a developmental league for the NFL so the best solution might be to force these guys to play there for a season before they can apply for re-instatement at the top level. Do we even know what Gordon failed a test for? I never saw an actual report on what it was he failed? Did he miss a test or piss hot? Anyone know? The league, NFLPA and reports said he failed multiple tests for banned drugs, not including PED’s or marijuana. He was even allowed to play for 2 more weeks while the secondary sample was being tested and the results shared with the NFLPA. that’s not true. gordon’s most recent ban was related to watered-down piss sample he provided. clearly something was up. You must have knowledge that no one else has regarding this situation. According to multiple sources, including the Patriots, Jay Glazer and an NFLPA spokesman, he was suspended for violations of his rules for reinstatement. All sources stated the failed test was NOT for marijuana, but for other band substances, and that Gordon refused to appeal the findings. How are you going to ‘water down’ a sample when the sample is taken in front of a league representative? Research how drug urine samples are collected and the chain of evidence needed to deliver them to a testing facility. Wasn’t Gordon just reinstated from a ‘lifetime’ ban this season? Yet after another transgression he might be back to start the season. Incredible. How about you do this NFL, if it’s a recreational drug (marijuana, heroin, crack, whatever), then let ‘me play. Only hurting themselves and the team if they do. However, if it’s a PED, then at least an 8 week ban the 1st time, and a whole season the next and each additional time. Reason being, that PED will provide an at athletic edge to the player and therefore the team. Imagine the fun watching your team needing a score to win late in the 4th quarter and your Star recieved goes to the sideline to smoke a blunt with the ball boy? Then instead of going back I got the game goes and gets a hot dog and beer from the concession stand. I’m for both returning as long as it’s made clear that this is their last chance and both are clean. If not what’s the point of even having a system in place and suspending them? If we’re being completely honest the whole decliplinary system not just substance abuse is a joke and needs to be completely reworked. Gordon needs to be done. Come on people. You struggle with a health issue (and it is a health issue) and your job fires you because you can’t heal fast enough? This is what’s tearing our country apart. The compassion is gone…. To play in the NFL is privilege, not a right. Being suspended over and over from the NFL is tearing our country apart? As a recovering addict myself. It’s a struggle until you accept full responsibility for your actions. These guys are in a tough world when it comes to their disease. The Patriots are paying for Gordon’s treatment, and will welcome him back if he shows that he’s willing to work on himself continuously. And yes, I know what I’m talking about. 10 years clean last November 1…. Congratulations on 10 clean years! It’s obvious being a Patriots fan has helped with your recovery. The NFL should absorb all of the other leagues – CLF, Arena Football League etc.. Arena Football League employees earn $37,500 annually on average, or $18 per hour, which is 48% lower than the national salary average of $61,000 per year. According to our data, the highest paying job at Arena Football League is a Football Player at $48,000 annually. For starters it’s the CFL which could never be absorbed by the NFL for dozens of reasons. So the ultimate punishment would be banishment to the Lingerie Football League? Some players would probably take up weed and booze to get there. Josh Gordon either needs to hire a babysitter or stay out of the league indefinitely. Can’t stand this back & forth.